PrideStaff, a national, franchised staffing organization, is pleased to announce that they have earned one of Inavero's Best of Staffing® Client and Talent Diamond Awards. Employers and job seekers who partner with us can be confident they'll receive a world-class service experience, every time. 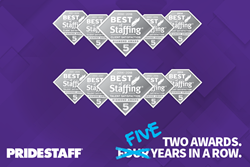 "Best of Staffing awards are extremely meaningful to our organization, because they directly reflect the caliber of experience we deliver for our clients and associates," said PrideStaff COO Tammi Heaton. "Everyone in our organization focuses on the things employers and job seekers value most; doing so allows us to build strong, loyal partnerships that benefit all parties involved.